"The Bank Mystery" is the 184th Mandrake Sunday story. The story was written and drawn by Fred Fredericks. Several bank robberies are carried out with the characteristics of the Mole. The only problem is that the Mole is at the state prison, in an escape proof cell, and his laser outfit was taken apart, smashed and blown up. 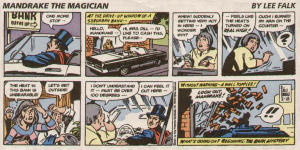 The title for the story is taken from the strip of March 1, 2001 (Beginning: The Bank Mystery). This page was last edited on 12 March 2016, at 11:52.